A working mother typically lengthens her day in order to carry out some domestic chores before and after work. While cleaning, shopping, cooking and other chores can be postponed, child care cannot since a baby needs constant care up to 5-6 years of age when s/he is able to understand what is right and what is wrong. Babies also require a good upbringing in a child friendly environment. They need proper education from an early age- an age which is appropriate to nurture their inner cognitive understanding. Beside a mother or parent, there can be other reliable family members like grandparents, uncles, aunts who may step in to assist as caregivers. However, if these mothers are in a nuclear family with a professional job, taking care of babies along with maintaining job responsibilities can be quite difficult and it needs a fine balance. This scenario is common among the dual income nuclear families in urban Bangladesh and that is when a nanny service or a child daycare centre can be a solution. Unlike Bangladesh, the concept of child daycare centre is very common in other parts of the world. So to begin with, let's take a look at what a child daycare center is. Child care can be bought by hiring a babysitter, using a daycare centre or a family day care home (Lave and Angrist, 1975). According to Hofferth and Chaplin (1994b), a child daycare center is defined as a licensed facility in which care is provided to a group of children younger than 13 years of age for up to 12 hours each day, 5 or more days a week. Another research highlights that daycare is an interdisciplinary phenomenon including individual, familial, governmental and social factors in Canada which interact with and impact upon each other. The demand and supply for child daycare service are being met in most of the developed countries. For instance, there is a significant demand for licensed child care services in urban Japan (Zhou and Oishi, 2005). In the past few years a major change has been observed among the Canadian families too which indicates increasing number of mothers of preschool children entering the workforce. The idea of child daycare center is relatively new in Bangladesh. There is a good market potential because in recent times more women are entering in to the labor force. According to Bangladesh Bureau of Statistics, Labor Force Survey, 2017- the rate of female labor force participation was 29.5% in 2010 and it grew up to 33% in 2017 indicating a steady increase in the number of working women. It is important to note that these working women generally belong to the age groups of 26-30, 30-35, and 36-45 year (BBS, 2017) who are mostly married and have children. Hence, the anticipated demand for child daycare centres among the women of such age-groups in Bangladesh is quite evident. So what do parents look for when selecting a child daycare service centre? Parents are often faced with complex multitude of characteristics with various alternatives when making a choice for child daycare service because there is always a trade-off. For instance, a parent may rate educational training of the caregiver as the most important factor but it may become less important when cost and hours of operation are considered simultaneously. According to a research study in 1987, parents should have childcare choices that are economically feasible indicating cost as an influential factor. Childcare expenses depend on socio economic variables such as family income, parents' educational levels, their social class and status too. Family variables (mother's emotional wellbeing, parenting skills, family socioeconomic status and family structure) appear to exert a greater influence on children's development than daycare variables (Phillips and Howes, 1987) because these variables may affect outcomes in children directly by influencing parental choices about childcare. Mothers who have positive feelings about their marriages are more sensitive and accepting of their children and are satisfied with their non-work time, have children who are securely attached, regardless of childcare arrangements. Mothers who exhibit more nurturing child rearing practices and receive more social support are likely to select higher quality child care (Howes and Stewart, 1987). Clarke-Stewart (1987) mentioned in their study that compared to caregivers in family daycare homes, caregivers in centers are more likely to have specialized training. The quality of the caregiver-child relationship is crucial which is identified in a study saying children with involved and responsive caregivers exhibit more exploratory behaviors are more positive and are more intelligent and sociable (McCartney, Scarr, Phillips, Grajek and Schwarz, 1982; Phillips, Scarr and McCartney, 1987) when compared to children with caregivers who are less responsive. Group size, adult-child ratio, caregiver training are also important factors because caregivers tend to be more responsive to small groups (Stith and Davis, 1984); children in smaller groups are more sociable with their peers (Clarke-Stewart 1987; Kontos and Flene, 1987). High quality daycare appears to have positive effects on children's intellectual development especially for children at risk (Breitmayer and Ramey, 1986). Quality daycare is associated with higher language scores on standardized language tests even for middle-class children (Rubenstein and Howes, 1983). The list of child daycare determinants may go on as different parents may have different priorities and they also depend on service availability. So, we can see that deciding on a child daycare service arrangement is a very complex balance act for parents. 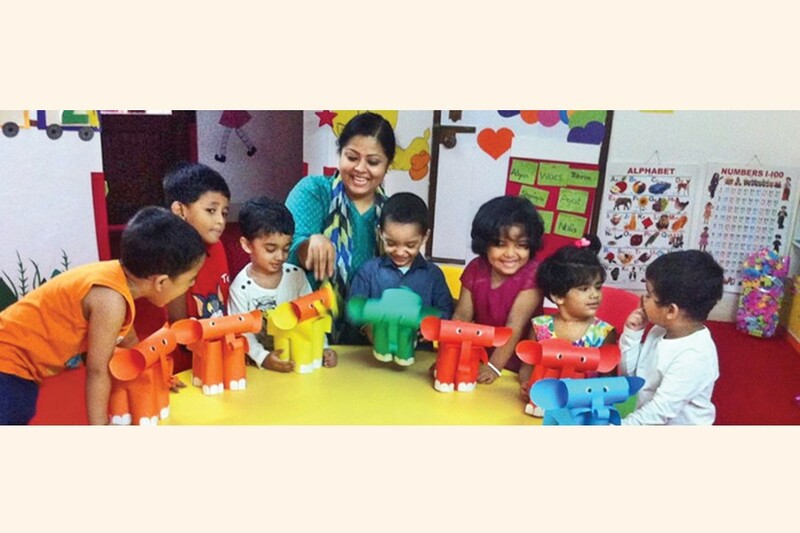 There are quite a few privately run preschool and daycare service centers in Dhaka. Little Steps (offers daycare and pre-school services), Le Petit Child Care Center, KiddieCare Preschool and Learning Center, Creative daycare and preschooling, Kids' Paradise, Childcheer, Sporsho Daycare are namely some of the few. In a research by Powell and Eisenstadt (1983) it is apparent that parents choose daycare for their children and the extent to which they use both formal and informal social networks in their neighborhoods. We know that word of mouth promotions play a vital role in any industry and child daycare service industry is not an exception. In fact, it is the most reliable source of information for any parents. Most of these daycare centres promise good quality service at a premium price but does everyone have the means to afford high end services? Being a developing country where there are many working mothers and not enough helping hand at home, it's about time for our government to initiate and subsidize child daycare services nationwide especially in urban areas of the country. This initiative can not only assist the daycare centres to provide improved and quality services but also help the families in need, financially. At the end of the day it is the nation as a whole which will be benefited because a well brought up kid is a valuable asset to any country. Someone quite aptly said- today's children are tomorrow's future.